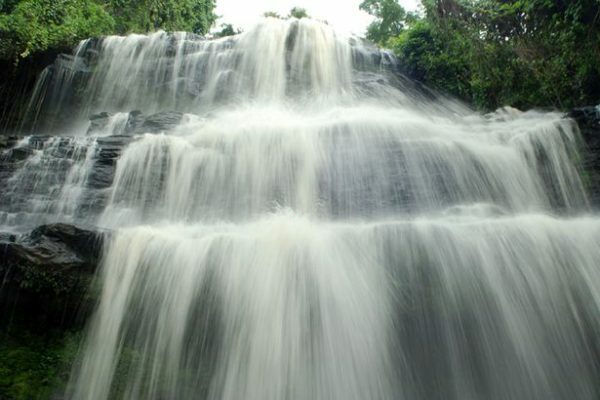 At least 18 people, mainly students, have been killed by a large tree that fell on them at a popular waterfall spot in Kintampo, Ghana, police say. The high school students were swimming during a storm when the freak accident happened. Twenty-two others were injured and are being treated at local hospitals. Rescue teams used chainsaws to cut through the fallen tree and free those trapped underneath, local media report. Ghana’s President Nana Akufo-Addo has tweeted his condolences to the families of the victims. Police and fire service personnel were involved in the rescue operation at the scene in Ghana’s central Brong-Ahafo region, 250 miles north of the capital Accra. According to Ghana’s Starr News that most of those involved were students of the Wenchi Senior High School, but that there were also tourists.